The meeting venue is at the University of Stavanger campus, located about 5 kilometers from downtown Stavanger. 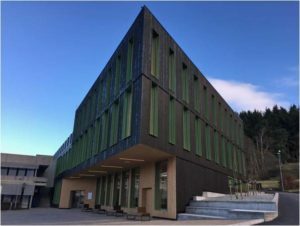 We will use several flexible and well-equipped classrooms and meeting rooms in a newly built wing of the humanities building, Hulda Garborgs hus, located right next to Stavanger Botanical Gardens. This building is a few minutes walk away from the nearest bus stop. Our main rooms will be N-106 and N-107. Stavanger Airport, Sola (SVG) has direct flights from 30 international locations, including London, Stockholm, and Copenhagen. See https://avinor.no/en/airport/stavanger-airport#directflights for a full overview. The airport is located only 15-20 minutes from town. There are two airport bus routes to town, one of which stops at campus (marked as via SUS and UiS) – see https://www.flybussen.no/en/ruter/stavanger for routes. We have a limited number of rooms booked at the campus hotel Ydalir. This is a new and very nice hotel located close to the meeting venue. We have a negotiated rate of NOK 940 per night, right under 100 euros. It is very conveniently located for the meeting itself, but if you want to see more of Stavanger itself, with its scenic downtown area on the water and the lively (but expensive) nightlife, you might want to book a hotel downtown instead and take the bus to the meeting. I recommend using a site like hotels.com to find rooms – I can recommend Comfort Hotel Stavanger, Radisson Blu Atlantic Hotel, Clarion Hotel Stavanger, and Scandic Park Hotel, but many others are also available. Hotels in Stavanger are not necessarily cheap, but right now there are many that have availability for prices around the 120 euro per night that COST covers. If you want to stay at Ydalir, you can book from hello@ydalir.no using the booking code: CostYdalir – please do so as soon as possible, before April 17. After this, they cannot guarantee that they will have rooms available. Stavanger has good bus connections from town to campus, taking approximately 20 minutes. For bus routes, see https://www.kolumbus.no/en/ – routes 6, 7, X60, and E90 stop at campus. I recommend installing the Kolumbus Billett app on your phone (iOS and Android) for the cheapest and most convenient tickets. You can also pay with cash on board, but not with card. Note that Norway uses kroner, not the euro! Stavanger is one of the largest cities of Norway, located down on the southwestern coast. The city was founded around 1125 with the completion of Stavanger Cathedral (which is still standing downtown). The Jæren region surrounding the city is today a major agricultural area, but was an economic and military centre as early as the Viking era. Stavanger has experienced several periods of dramatic economic growth: first connected to the canned fish industry of the 19th century, and later with the oil industry from the 1970s. Today, Stavanger is the oil capital of Norway. Stavanger is a very international city with a great food scene, and was also the European Capital of Culture in 2008. It has many good museums – the Oil Museum and the Canning Museum are both highly recommended. Walking around old town Stavanger, with the densest concentration of wooden houses in Norway, is also worthwhile. Climate-wise, June is one of the nicest months in Stavanger, but note that it rains fairly often here, so it would be wise to bring an umbrella. The meeting is sponsored by University of Stavanger; The Greenhouse: An Environmental Humanities Initiative; and the Research Council of Norway.